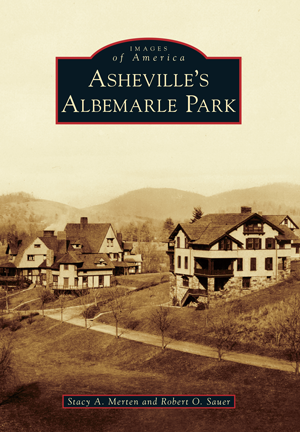 Albemarle Park was envisioned as a picturesque mountainside resort in north Asheville. It was a great success due to the collaborative efforts of railroad executive William Greene Raoul and his son Thomas; Bradford Gilbert, architect of New York City's first skyscraper; and Samuel Parsons Jr., landscape architect for the City of New York. The Manor and its surrounding cottages served as an alternative to standard late-19th-century Asheville hotels and boardinghouses. Dances, plays, bowling, archery, golf, motoring, and equestrian events were available for guests to enjoy, and meals were sourced from The Manor's own farm. Notable guests of The Manor included Eleanor Roosevelt and Grace Kelly. It was also a film set for The Last of the Mohicans. Consisting of enchanting architecture and romantic landscaping, Albemarle Park was listed in the National Register of Historic Places in 1977 and as a local historic district in 1989. Through family archives, private collections, and ephemera, Asheville's Albemarle Park showcases the history of this significant Asheville neighborhood. Stacy A. Merten is the director of the Historic Resources Commission of Asheville and Buncombe County. Robert O. Sauer is a preservationist and longtime resident of Breezemont cottage.